You might have seen my previous post for Strawberry Pate de Fruit. As soon as I had my first taste, I was hooked and knew I'd have to try out some more flavors. Well, today it's pineapple! I'd love to say that these candies were smooth sailing. After my fairytale experience with the strawberry, I had high expectations. 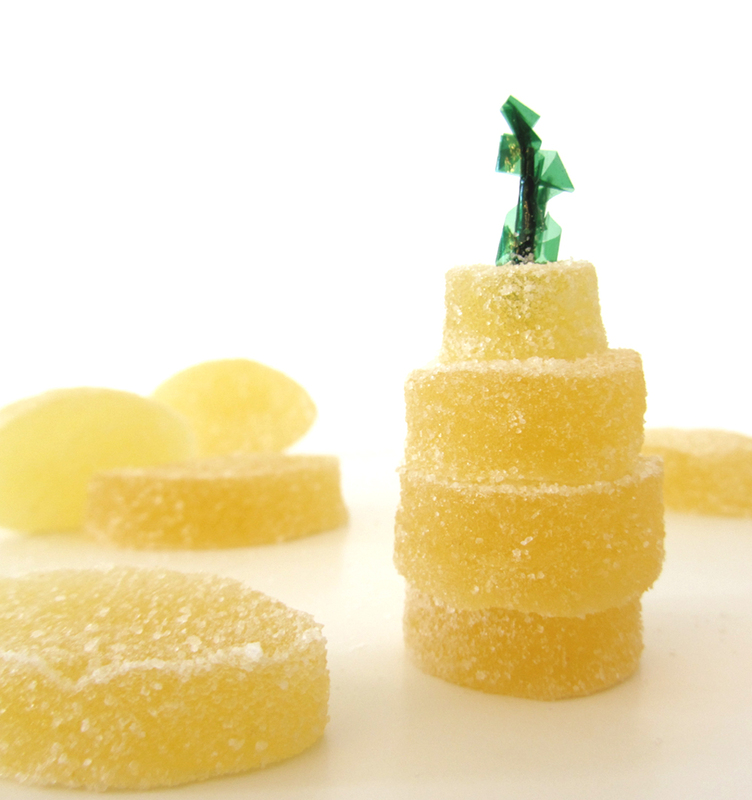 Unfortunately, my first attempt at the pineapple pate de fruit was a dismal failure. I had used a recipe by Emeril Legasse. The first problem was the time it took to bring the candy up to temperature. There was so much liquid, that it was cooking for a long while. In that time, all of the pineapple flavor was lost - along with the beautiful yellow color, which turned an unattractive orangey gold. Also, the recipe called for pure pectin, which I take to mean powdered (since liquid has additives). As soon as I added the pectin, though, the texture was ruined (from silky smooth to kind of pulpy looking). I went ahead with it anyway - I mean, I'd invested a pineapple, four limes, and time after all. I followed the recipe to the end. Many hours passed... Not surprisingly, the candy never set up properly. So, what I ended up with was unattractive, ill-textured candy with an almost caramelized, indistinguishable flavor, that wouldn't hold it's shape. Into the trash it went. It was time to find a new recipe. There didn't seem to be a lot to choose from and the ones that I did find weren't what I was looking for. After a lot of searching, I finally came upon a recipe, credited to Chocolates and Confections by Peter P. Greweling, at The Broken Ganache. With very little liquid to start with, the cook time was significantly reduced and the pineapple retained its flavor very well. The color was a lovely, bright yellow. The recipe used liquid pectin and resulted in a soft and smooth candy. The result: wonderful pate de fruit - just like I was hoping for! So - thank you to The Broken Ganache for a very helpful post! Pate de fruit is such a perfectly marvelous delicacy. You're doing yourself a real disservice if you don't treat yourself to some - and soon! 1. Line an 8" X 8" baking dish with parchment paper. Spray lightly with oil. Set aside. 2. Pour the puree through a fine mesh strainer, into a medium saucepan (this is to strain out any tough fibers and seeds - you should end up with a very small mostly-juiceless lump to discard). 3. Stir the 1 1/2 cups sugar into the pineapple. Set the pan over medium-high heat. Bring the mixture to a boil, stirring often. Reduce the heat to medium. 4. Cook, stirring constantly, until the mixture reaches 238°. Remove the pan from the heat. 5. Stir in the pectin. Return the pan to medium-high heat and bring the mixture to a boil. Once boiling, cook, stirring constantly, for one minute. Remove the pan from the heat. 6. Stir in the lime juice. Pour immediately into the prepared baking dish. Spread evenly. Allow the candy to cool completely. 7. Put the superfine sugar in a small bowl. Using an oiled knife or small cutters, cut the pate de fruits into pieces. Toss a few pieces at a time in the sugar. 8. Serve! To store: cover and chill. How did you make that 'puree'? I have seen expensive jars of those online. I cannot afford those.